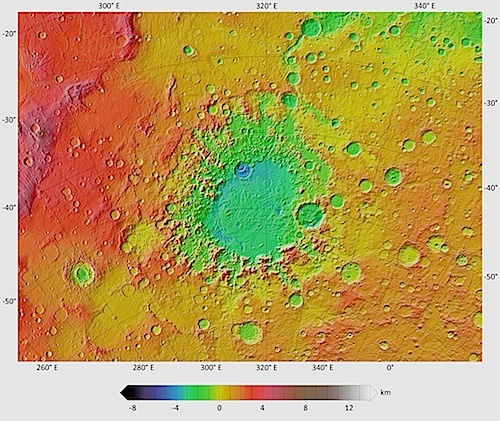 On the biggest scales, Mars has craters with diameters that measure many hundreds to thousands of kilometers. The largest known is the Hellas Basin (2300 km/1400 mi), That would be like driving from New York City, New York, to Wichita, Kansas. Other basins include Argyre and Isidis. Argyre has a 700 km (430 mi) (about twice the length of the Grand Canyon) central plain surrounded by a rim about 1800 km (1100 mi) across. Isidis has a diameter of 1500 (900 mi), but its floor is covered with lava. In all, scientists have identified (or tagged as probable) about a dozen impact basins. But surely more lie undiscovered. Scientists are also debating what role, if any, one or more giant impacts played in the formation of the northern lowlands. Impact basins characteristically have a large central depression surrounded by an obvious rim, which is often elevated. (Greatly eroded basins may lack a clearly defined rim.) Also, careful examination of the landscape around the basin usually reveals one or more circular rings, centered on the big depression. Scientists interpret these as slump scars similar to the terraces that form inside complex craters, but on a much bigger scale. Scientists estimate that a basin on Mars would take about half an hour to develop after the impact. However, collapse, settling, and lava eruptions through the crustal fractures would continue for millions of years longer. The big basins with multiple rings are all old. The reason is that early in Mars' history, impacts from large objects such as asteroids were more common than they are now. This is because Mars, the other planets, and moons have mostly swept up the population of large objects in the early solar system. Meaning that the average impacting object has decreased in size as time goes on, and these produce smaller craters on average.